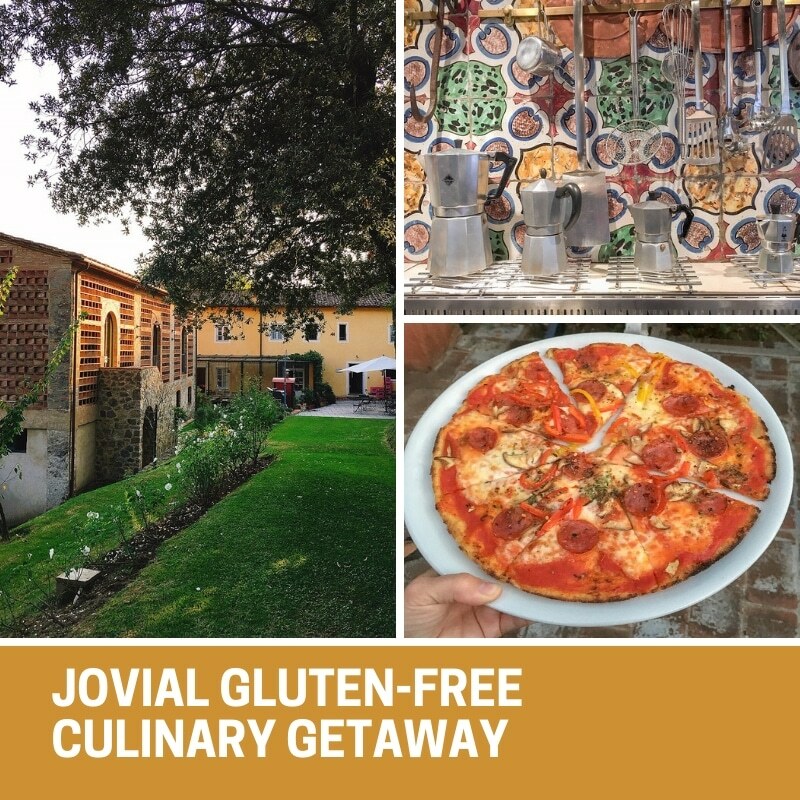 My husband and I attended a Gluten-Free Culinary Getaway organized and hosted by Jovial and it was an incredible experience that we will never forget! This post was sponsored by Jovial. Opinions are my own. Have you ever wanted to travel to the Italian country-side and spend an entire week eating gluten-free? What if I told you that you would also learn how to bake some of your favorite gluten-free breads, pasta, and pastries? Italy has always been one of our favorite places to travel since going gluten-free. We’ve been to Italy several times, and each time we’ve discovered something new and eaten at some of the most amazing gluten-free bakeries and restaurants. Jovial is known for their high quality olive oil, canned tomatoes, canned beans, whole grain flours and bread flours, and their gluten-free and einkorn pasta. We were happy to discover that they also host two gluten-free culinary getaways a year in Tuscany (and two non-gf culinary getaways). 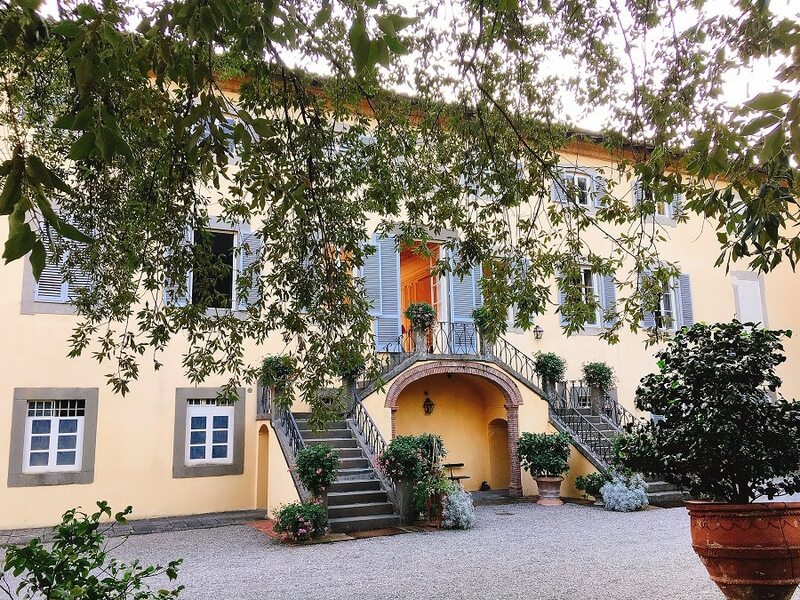 The getaway is held at a stunning 18th century villa in a small town within a 15 minute train ride from Lucca, Italy in Tuscany. The villa estate sits just up the hill from a train station and is surrounded by the gorgeous Italian countryside. The guest rooms are large and tastefully decorated and the gardens that surround the villa and pool are picturesque. My husband and I spent hours walking around the estate sipping wine and relaxing, and dreaming of how we would expand our garden next spring. 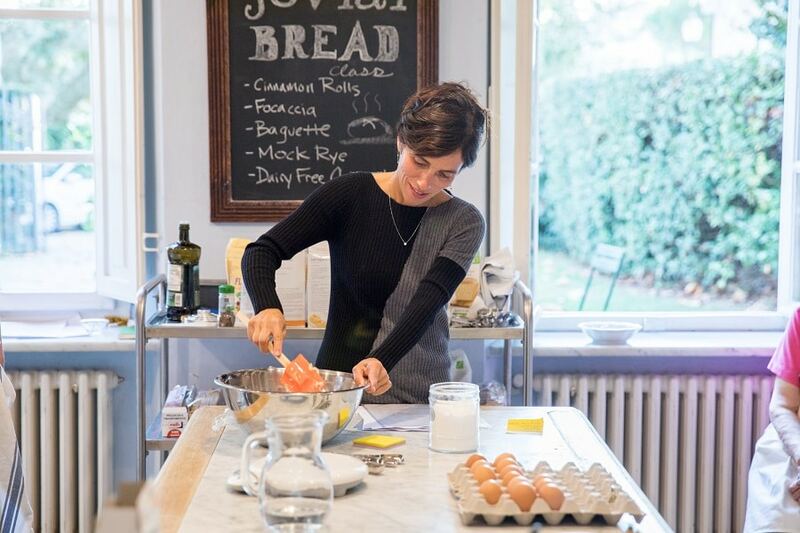 The Jovial culinary getaway includes three cooking classes and each of the three gluten-free cooking classes is taught by Carla (and spoiler, one is actually a cooking COMPETITION). Carla, the owner of Jovial, takes care to make sure that each person has a chance to ask questions and participate. We learned how to make gluten-free pastries and desserts, gluten-free breads, gluten-free pastas, and gluten-free pizza. Each night after the gluten-free cooking classes Carla and her team prepared a huge, delicious meal. We went to bed with our stomachs full of great food and wine. The kitchen at the villa was stocked with jovial products like canned tomatoes, beans, tuna and pasta and the refrigerators with milk, butter, eggs, and local produce. And everywhere we looked we saw bottles of wine. Each morning Carla rose early to have a “continental breakfast” ready before attendees left to explore for the day. 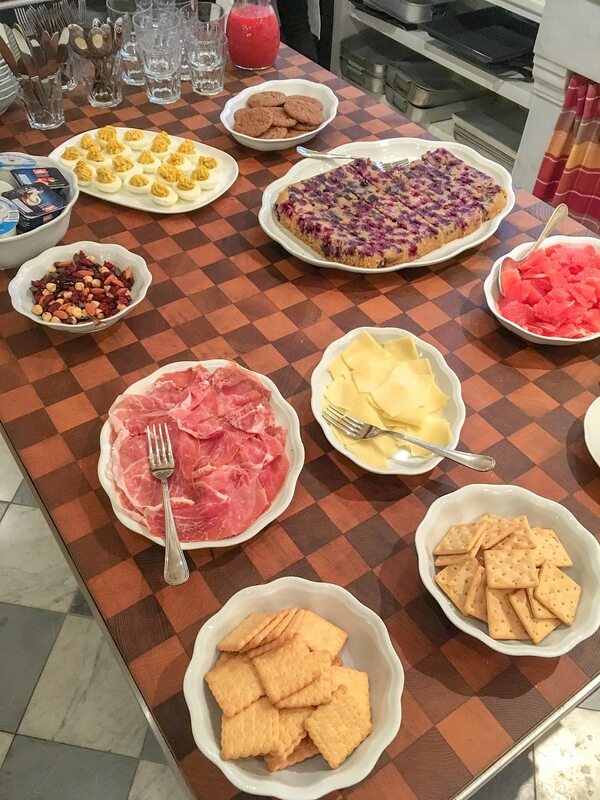 Her continental breakfasts were larger then most American breakfast buffets and often included several handmade pastries, meats, cheeses, fruit, and eggs. The coffee pot was always full and there was never a shortage of things to eat. One of the many things that I loved about this culinary retreat was that all the leftovers from breakfast and dinner were placed in the refrigerator. There were a few times we came back from a long morning out and were able to reheat leftovers for lunch. Between the welcome dinner, breakfast each morning, the cooking classes with dinner, and leftovers, we didn’t need to eat out. Ample food was provided by Jovial and the few nights that we didn’t have a class we purchased local meats and produce and cooked dinner in the kitchen with other guests. There’s something magical about making dinner in a 18th century kitchen in Tuscany while sipping wine and getting to know new friends. One thing that I didn’t expect was the way I would feel at the end of the jovial gluten-free culinary getaway – I felt sad to leave Tuscany and our new friends. While I did miss my own bed and my kids, I had such and incredible time that I didn’t want it to end. We made new friends, ate the most amazing food, and explored Italy daily. The group that attended the culinary getaway consisted of some of the most thoughtful, funny, and down-to-earth people (from all over the world) and we had such a strong connection with them that we are already planning how we can attend future culinary retreats together. Don’t be afraid to travel in Italy, it’s easy. We flew into Rome and took a train from Rome out to Lucca. There are some non-stop trains, and some that transfer in Florence. We then took a local train from Lucca to Ponte a Moriano (where the Villa is). The villa is a 20 minute walk up the hill, or you can call for a ride. We walked to and from the train station each day to explore the other little towns in Tuscany. I want to thank Carla and her Jovial team for the experience of a lifetime. You have taught us so much, shown us more then we could imagine, and we will carry the memories created with us forever. 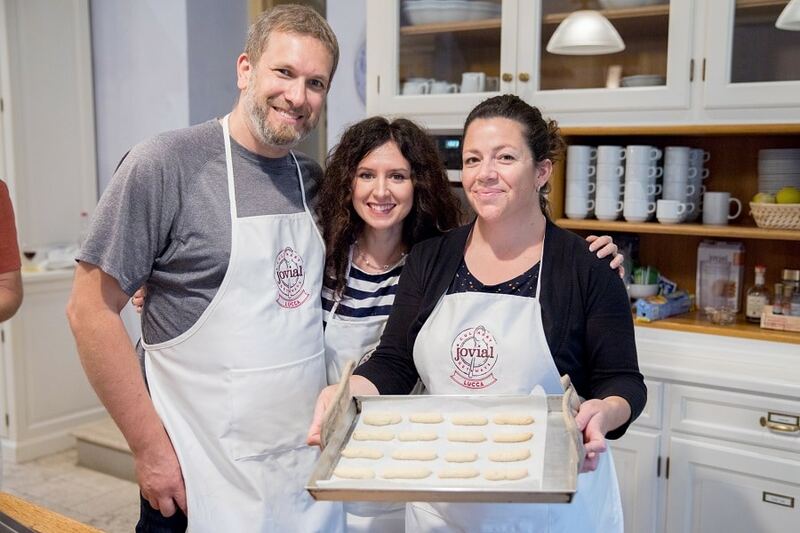 I attended this gluten-free getaway with my husband and my friend Brianna from Flippin Delicious (and her husband). She wrote a lovely post called Jovial Gluten-Free Getaway if you’d like to learn more about our experience. A bucket list trip for me! One day. Sounds like a wonderful (and delicious) experience! Thank you for stopping by 🙂 It definitely was a a trip we will never forget. Thank you so much for following along and stopping by to leave a comment 🙂 It was such an amazing experience. I wish more places (and countries) had retreats like these for those who are celiac and non-celiac gluten intolerant. I would love to attend this getaway!